This particular day was the first, and one of the only, vacation days I didn’t feel compelled to get up early. 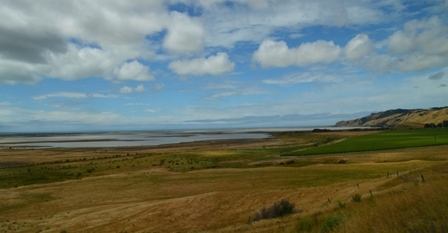 I didn’t have any place to be until 1300, so I walked around Picton, browsed in the shops, and had a leisurely lunch. 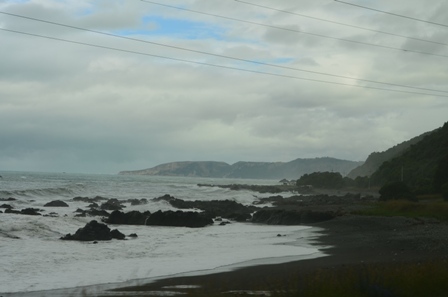 After lunch it was time to catch my train from Picton to Christchurch. One train a day takes that route, and the journey typically takes over five hours, whereas a plane ride takes about an hour. So why choose the train? In truth, at the time I seriously looked at transport options, the train was cheaper than a plane. 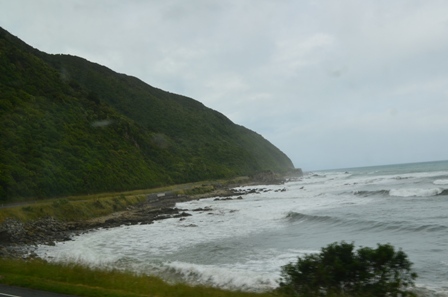 Plus I factored in the two hour bus ride to the Nelson airport. 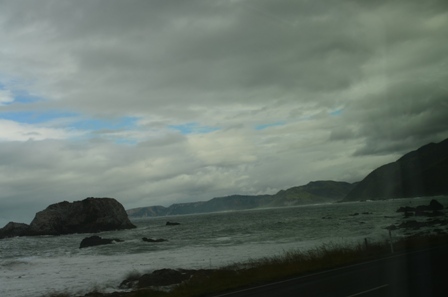 I wasn’t in a hurry to get to Christchurch, and didn’t have a jam-packed itinerary in Christchurch. 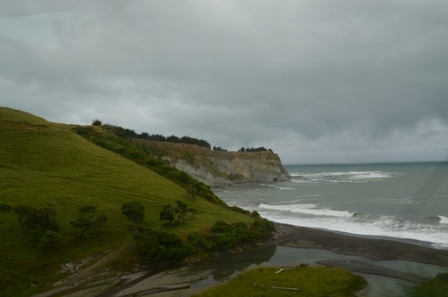 I read many good things about the Coastal Pacific train ride, so I decided to slow my vacation pace down and enjoy the opportunity to see beautiful New Zealand scenery I wouldn’t otherwise have the opportunity to see. The train set a very leisurely pace (seriously the bus or car would have been faster), but rolled through a wide variety of landscapes. 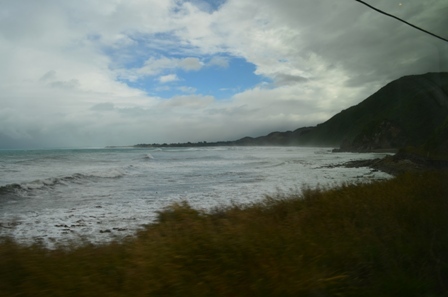 I had a perfect window seat on the east side of the train to see the coastline and the inland plains. 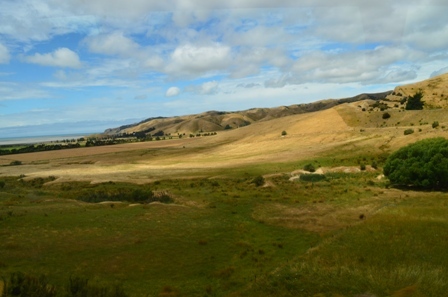 The hills south of Picton were lush vineyards, rolling fields and hills of gold that transitioned to lush, green native forest and hills. A good portion of the ride skirted the east coast and I was treated to views of lots of sheep and cows. 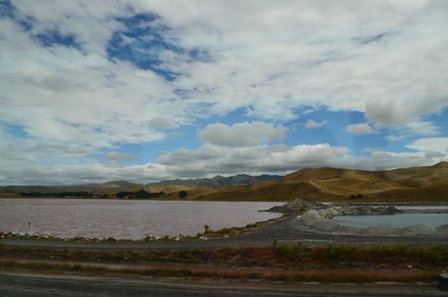 We passed Lake Grassmere, where the majority of New Zealand’s salt is produced. 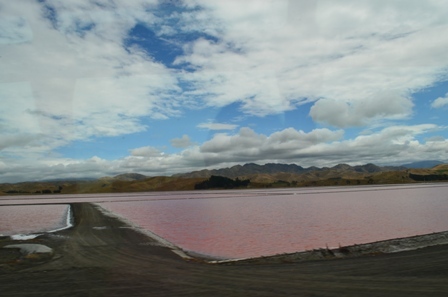 Many of the salt ponds were pink due to the large numbers of green algae that turns to pink in the presence of a high salt concentration. 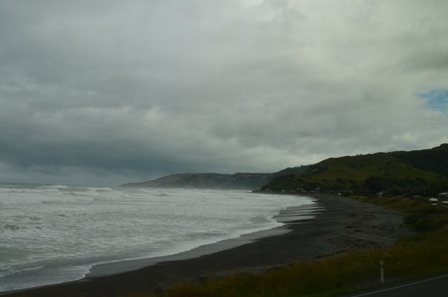 As we moved further south, the gentle rolling waves of the ocean changed to fierce crashing breakers set among dark beaches, hills and rain clouds. Many parts of the coastline reminded me of Iceland, which isn’t surprising since a good chunk of New Zealand reminded me of Iceland. The farther south we traveled through Canterbury, the plains started to remind me of the ones I’ve seen in the Scottish Highlands. 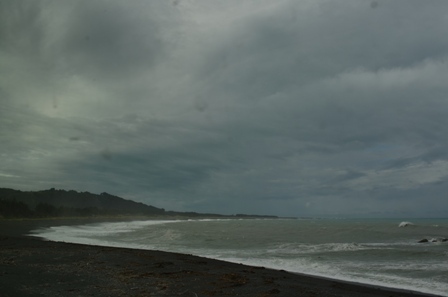 The sky and clouds became grayer and mistier, with spots of rain as well. 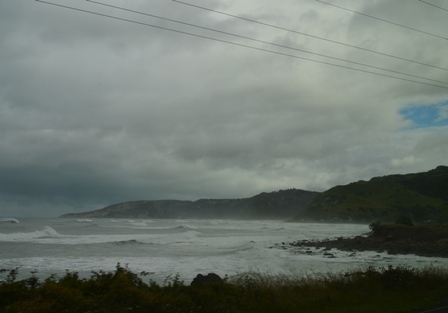 It practically was full on storming by the time we got close to Christchurch. Sometimes I was able to capture the beauty with my camera, and other times I just let it float by and took it all in for the memories. 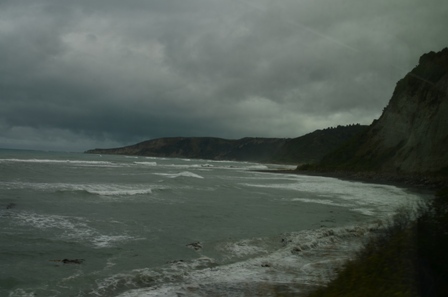 If you like beautiful scenery, and don’t mind a very scenic journey, by all means take the time for the Coastal Pacific train ride if you are heading between Picton and Christchurch. 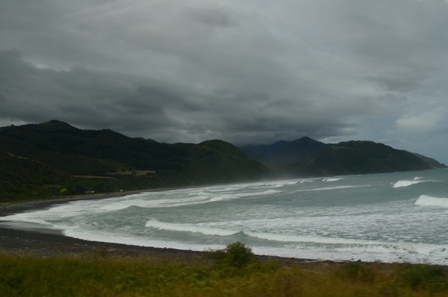 This entry was posted in Travel and tagged Canterbury Plains, Christchurch, Coastal Pacific, Lake Grassmere, New Zealand, Picton, train ride.